I'm spending way too much time on Etsy lately. Want to see some of the things I'm looking at? This vintage sheet covered in pink roses. I want it for future quilt backings. It's inexpensive and it's in good shape. I don't know why I haven't bought it already...maybe I need to remedy that. 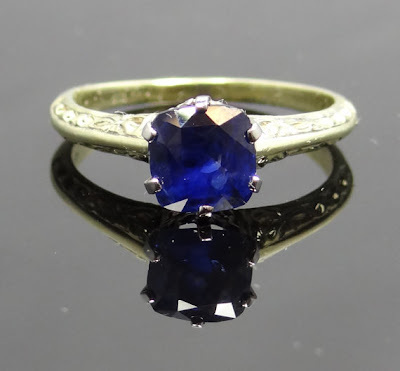 This vintage sapphire ring. It's from the 1900's-1910's and it's made of green and white gold. It would be a major splurge but I think it's gorgeous. Sapphires are my favorite stone. My engagement and wedding rings have sapphires and diamonds. 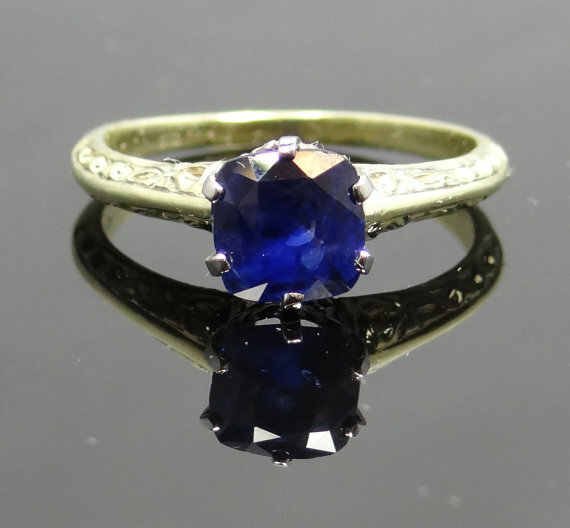 And both of my children were born in September; sapphires are their birthstone. 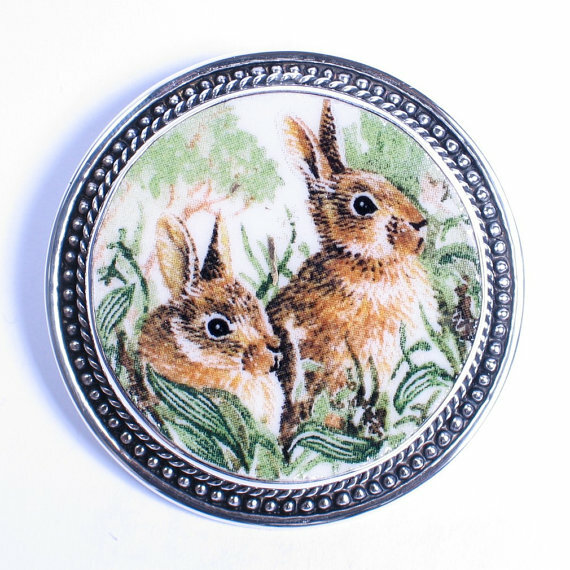 I just can't stop looking at this brooch. This seller makes jewelry with bits of broken pottery and china set in metals. This one is from a Wedgwood Queen's Ware design called "British Mammals." 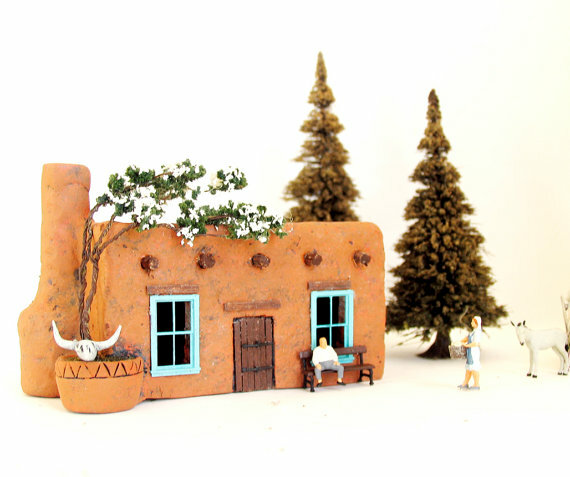 This little model of a traditional adobe house appeals to me because it looks a lot like my house. We have a pueblo-style house in earthy stucco with blue trim. Architecturally, it looks like a regular 1980's ranch-style house on the inside, but the builders did a good job making it look somewhat authentic on the outside. My lifelong love of dollhouses and scale models and my newfound love for Southwestern architecture collide in this little model. There I am in the front yard. I even have a cow skull. I do not have donkeys or a guy on a bench but it could be arranged. Finally, I'm stalking an entire fabric shop at the moment. I haven't bought anything from her yet but I can't stop browsing her shop. Her collection of Lecien New Old 30's fabrics is to die for. She has everything. If only I didn't already have a lot of fabric waiting to be used. I think her shop may be my next birthday-shopping-for-myself destination. I love etsy. I am not a pinterest girl but I spend plenty of time on etsy. Yesterday I purchased 4 American Girl dresses on Etsy for the new American Girl doll I purchased to give my granddaughter for her birthday next week. I am excited to get them. I love the sheet. You should definitely get it. I haven't seen green gold before. With all the sapphire significance in your life it seems like the ring is meant for you. The southwestern architecture is beautiful. I loved it when I visited Arizona and New Mexico. Lovely selection, especially the brooch. There are some lovely things on Etsy. I love all of your picks especially the fabric and fabric store. 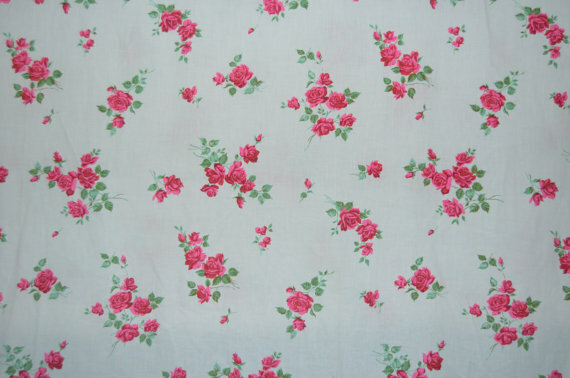 I absolutely adore the rose fabric and anything from the 30's so I may be in trouble...lol, I feel a splurge coming on. Oh, I'm just going to encourage you. The ring, the ring, pick the ring! I love sapphires! Such a pretty blue, and a piece of history. I have my grandma's ruby ring from the 30's and I cherish it. That sapphire ring is so pretty! I really need to spend more time on Etsy! I've bought a few things there before but after seeing all the goodies you've found, I'm wondering if I'll be able to find the perfect counter tidy there! I love the mini house! That tiny handmade house is darling. I would have a hard time not buying it - I'm a huge lover of miniatures.